Wednesday night's appearance will be Obama's fifth on "The Tonight Show," his third since he became president. President Barack Obama will be making his fifth appearance on "The Tonight Show" on Wednesday. 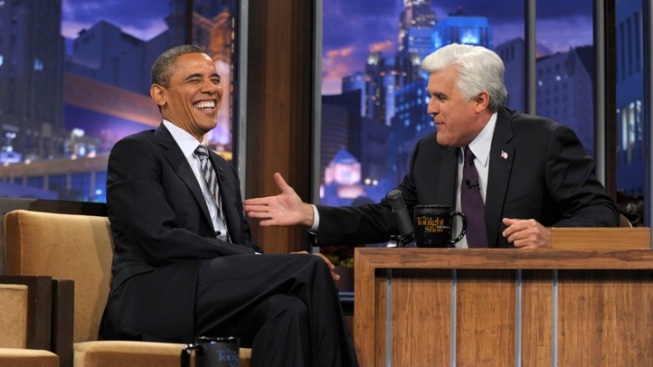 President Barack Obama will be sitting down with Jay Leno on the set of "The Tonight Show" Wednesday, less than two weeks before Election Day. NBC says Wednesday night's appearance will be Obama's fifth on "The Tonight Show," his third since he became president. Obama has been making the late-night rounds as the presidential campaign has picked up steam. He was on CBS' "Late Show With David Letterman" last month, and chatted with Jon Stewart on Comedy Central's "The Daily Show" last week. Mitt Romney has avoided the late-night talk shows since he became the Republican party's presidential nominee. But his wife, Ann, did appear on "The Tonight Show" last month.